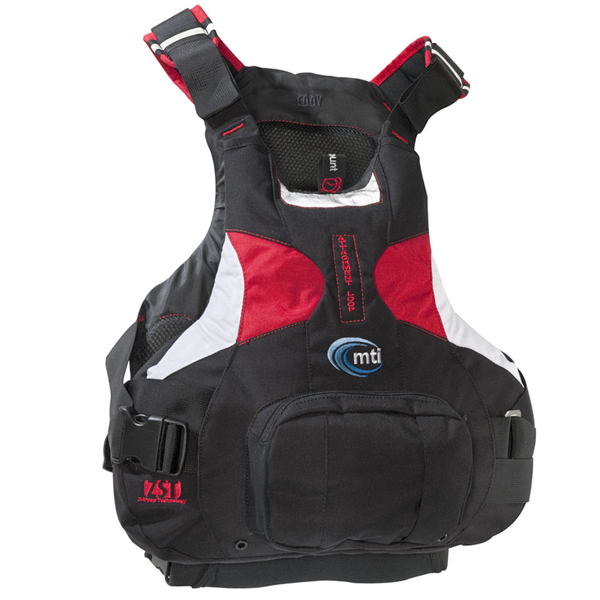 The best PFD is the one you will wear. Life jacket, life vest, Personal Flotation Device (PFD) – whatever you call it, it only works if you wear it! Did you know that nearly 70% of all drownings involving canoes, kayaks, or rafts might have been avoided if the victim had been wearing a life jacket? Or that 9 out of 10 drownings occur in inland waters, most within a few feet of safety? It wasn’t so long ago that when you’d ask someone to wear a life jacket, they would roll their eyes and say, “I can swim.” Most boaters found life jackets cumbersome and chose not to wear them. But times have changed. The good news is that the life jackets of today are stylish, comfortable, and very wearable. And a PFD with bright colors is easier to see and may increase your chances of rescue. To work best, PFDs must be worn with all straps, zippers and ties fastened. Tuck in any loose strap ends to avoid getting hung up. Offshore Lifejacket: Designed for extended survival in rough, open water. It usually will turn an unconscious person face up. Think “Titanic”. Flotation Aid: Bingo! This Type is the “Paddler’s Choice” because they are generally considered the most comfortable. For use in calm water where there is good chance of fast rescue since they will generally not turn an unconscious person face-up. While we want you to wear it, you are “USGC legal” by just having it accessible in the boat with you. Throwable Device: These are designed to be thrown to a person in the water — boat cushions, ring buoys, and horseshoe buoys. They are not designed to be worn and must be supplemented by a wearable PFD. Think “nautical decoration” at the yacht club. Special Use Device: This is the most confusing category for most people. “Special Use” PFDs include commercial whitewater rafting vests, vests with rescue harnesses, work vests, deck suits, and hybrid inflatables for restricted use. Basically, it’s anything that didn’t fit the requirements for being neatly classified as a Type I, II, or III, but still offers good buoyancy aid IF used under the conditions outlined on the USCG stamp inside the jacket. In most cases for paddlesports, the user MUST wear the jacket for it to be legal. Be sure to READ the USCG instructions sewn or printed on the device. Inflatable Life Jackets: These rely on inflatable chambers that provide buoyancy when inflated by a C02 cylinder. Uninflated, they are less bulky than foam jackets. The specific type is determined by characteristics such as its amount of buoyancy, its in-water performance and its type of inflation mechanism. Most adults only need an extra 7 to 12 lbs of buoyancy to keep their heads above water. A PFD can give that “extra lift”, and it’s made to keep you floating until help comes. Your weight is not the only factor in finding out how much “extra lift” you need in water. Body fat, lung size, clothing and whether the water is calm or rough, all play a part. In general the MORE PHYSICALLY FIT YOU ARE, THE MORE LIFT YOU NEED. Minimum Adult Buoyancy Per PFD Type. Type V Special Use – 15.5 to 22.0 lbs. Don’t put heavy objects on it or use for a kneeling pad or boat fender. PFDs lose buoyancy when crushed. Don’t attach it to your boat. Inspect for wear & tear and test in water annually. Make sure that fabric straps, buckles, zippers and hardware are working properly. Check for holes, tears, fading or mildew – fading can indicate a loss in material strength, allowing it to tear easily. Occasionally handwash in mild detergent to prevent mildew, rinse and hang to dry. Drip dry thoroughly before stowing in a well ventilated place. Do not dry clean! The solvents and heat can disintegrate the foam. Always check to make sure the indicator point shows GREEN before boating. RED means your jacket is not armed. When not in use, remove the cylinder. Check all components for dirt, corrosion, or punctures. 200 Denier Polyester: Has a soft hand with good cut and abrasion resistance, as well as excellent UV stability and drying properties. Very good comfort and good durability. 420 Denier Nylon: combines exceptional abrasion resistance and strength for good comfort and exceptional durability. CORDURA fabric is what most respected brands around the world use when they need to make a product that’s durable, versatile and reliable. Using high tenacity fiber technologies, ounce for ounce, CORDURA® fabrics are more durable than comparable fabrics and offer a superior strength-to-weight ratio. It is also highly resistant to abrasions, tears, and scuffs – perfect for the demands of on-water activity. Cordura Plus: takes the virtues of Dupont Cordura air-textured nylon (strong, lightweight and abrasion resistant) and makes it softer. Very good comfort and exceptional durability. Cordura Plus is used in MTIs highest quality models. PE Foam: offers excellent recovery and good comfort. A more rigid foam, MTI uses layers of PE to make it as supple as possible, and often combines PE and PVC in the same jacket to keep comfort high and price down. PVC Foam: Very soft with excellent recovery properties. It is most comfortable, and also the most expensive. MTI shapes and cuts each foam piece for maximum performance. Informative article on PFD’s! We agree – take water safety seriously. For long lasting durability and dependability, choose a PFD with CORDURA® brand fabric.